Corrosion rates can vary between welded and non-welded metals, therefore it is advisable to study the behavior of both conditions. Studies involve examination of the parent material, the heat-affected zone, the weld metal, and the interfaces between all metals involved. The surface effects produced by welding, heat-tint formation or oxidation, fluxing action of slag, and the deliquescence of slag can be important factors in the corrosion behavior of metals. Ideally, the coupon used should be the same thickness and welded with the same welding process as the material used in the production equipment. Usually this is not practical so a representative sample must be studied. Typical welding techniques used are Shielded Metal Arc (SMAW), Gas Tungsten Arc (GTAW), and GAS Metal Arc (GMAW). Specimens are ground smooth after welding, unless otherwise specified, so as to provide a uniform surface for microscopic investigation. Welded coupons can be prepared with or without the use of filler metal. The autogenous weld is prepared without the use of filler metal. 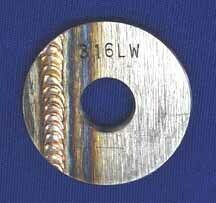 This type of weld is the most economical method. Autogenous welds are commonly used to evaluate corrosion rates of welded materials and the usage of these materials in corrosive environments. An autogenous weld is produced by GTAW and can be used to test material weldability and gas shield usage, and to set welding parameters. 120 grit standard finish unless otherwise specified. 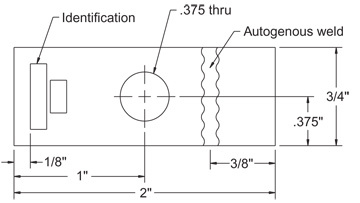 Standard weld is autogenous weld across end (A.W.A.E.). Sanded after weld.